I had a great week! I spent Sunday running and walking around Boston, you may have seen my trip in the last post. My Saturday long run was 20 miles, and it was by far the best I've ever felt at a distance longer than a half marathon. I'm so, so happy and hope it stays that way. More on the 20 miler below. Now, the recap. We ran the Freedom Trail running tour for about 3.4 miles, then continued on along the Charles River to Cambridge. It was great weather and so much fun to tour Boston this way. We walked so much after the run (and really, the whole weekend) that my feet hurt a ton! 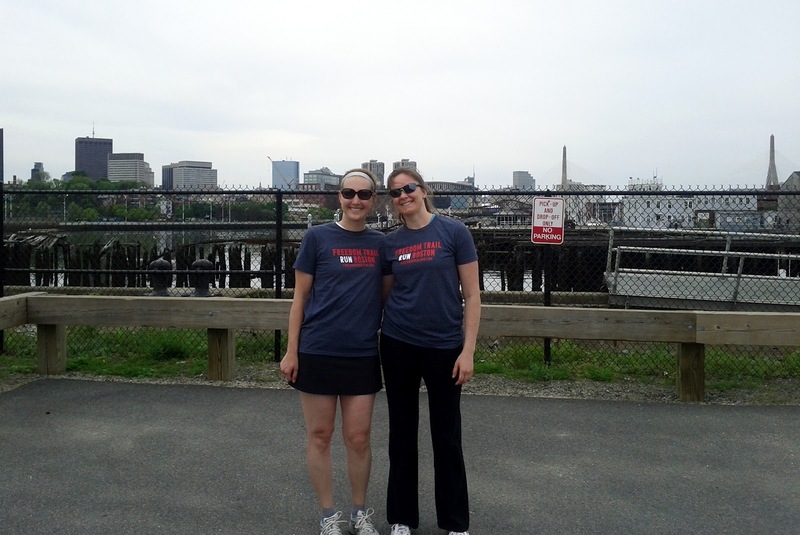 Also, I forgot one of my fave photos from the end of the run in the last post - our matching Freedom Trail Run shirts. My jet-lagged and sore feet self did not want to do anything but skip running and head to the mall, but I got out there for a short run with a friend after work. So glad she was there to encourage me. As always, I felt great post run and would have regretted skipping. I was 1.5 miles short, but in the grand scheme of training not a big deal. Another fun class with lots of leg work at the beginning, such as black band squats and lunges walking forward & backward. She added in some cardo activities outside too, always a good change. For the first time since starting the class, I was not super sore after. I considered upping this one to make up for Tuesday but thought better of it with the 20 miler coming up over the weekend. I ran with a friend again, keeping the pace nice and relaxed. We hit some strong wind - reminiscent of Big Sur - for the last couple of miles and had a good challenge there. Completed: 20 mile long run! Don't let your mind give out before your legs do. It's funny how little sayings can help, but it really works for me. I'm aware that my mind is my first problem when I want to stop pushing and I'm working hard to get past that. Even more interesting, our normal route along the Guadalupe River Trail had a mishap around 10:30 Saturday morning. Volunteers cleaning in the area found a body! 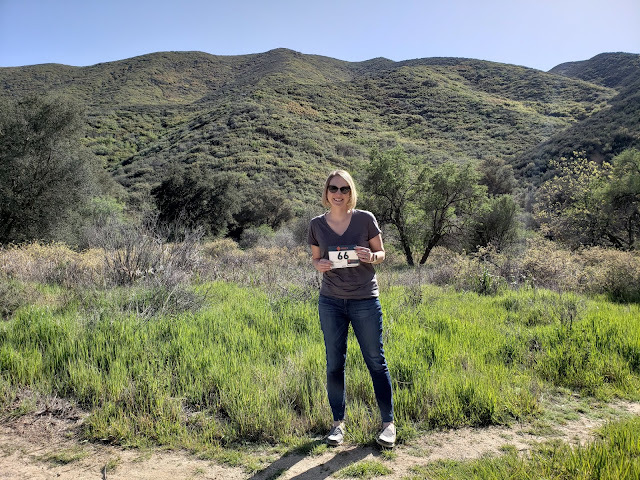 If we had gone that route, the route we randomly decided not to take after we'd already started running, we'd have been through before that volunteer crew. It could have been us that saw the body...and that thought scares the heck out of me. Thank goodness for our decision to head to the Alameda. Anyway, I finished the 20 strong and it didn't even hurt to walk up the stairs to our condo. I'm calling that progress. Oh wow!! I had no idea about the body on the Guadalupe! Honestly there's some sketchy stuff going on down there sometimes close to downtown. It sounds like we live really close to one another! I'm right by Diridon Station/HP Pavilion. We need to meet up one of these days! We definitely need to meet up soon. I keep thinking that too. We followed the Alameda (which turns into El Camino) out to Sunnyvale and back. It was a nice change, but be prepared for lots of stop and go with lights. That part was annoying! The Santa Clara section is prettier and nicer because the walk signs trigger with the button, most of the waiting was the Sunnyvale part. There is a cute little duck pond in Santa Clara with a water fountain too! Feeling strong after a 20 miler is a great accomplishment! Freaky about the whole "found a body" thing - so glad it wasn't you who found it! I love that quote: Don't let your mind give up before your legs! Such a great analogy. When runs get tough, often times its your mind that's the first to want to give up. Great job on the 20 miler! You are going to do GREAT on your marathon. It's all mental (well mostly-hehe) so having a great 20 mile run is such a fabulous feeling. Great job! It means your training is working. Thanks! And yes - so much is mental, I agree! Paulette, you are such an inspiration! 20 miles is awesome. And... Super scary about the body. Love reading your updates! !